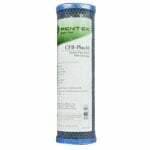 This Pentek FloPlus-10 is a 10 inch carbon block water filter replacement for use in many water filter systems, especially under sink water filter systems, reverse osmosis systems, and more. The Pentek FloPlus10 is a standard diameter filter (2 1/2" diameter) that maintains a relatively high flow rate despite its very low 0.5 micron rating. The Pentek FloPlus-10 is made specifically for applications where a low pressure drop combined with comprehensive depth filtration is needed. Able to withstand a maximum temperature of up to 180 degrees Fahrenheit, the FloPlus-10 can also be used in high temperature applications. 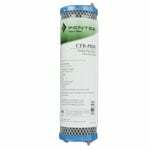 This advanced Pentek water filter replacement cartridge is specifically made to reduce the bad taste and odor of chlorine and other chemicals in water. It is a dual purpose water filter cartridge in that it also removes and reduces sediment, dirt, rust, sand, silt, limescale, and other common particulates. Additionally, the Pentek FloPlus10 removes 99.95% of harmful cysts such as cryptosporidium and giardia. 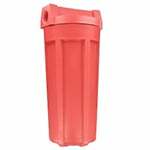 This Pentek FloPlus 10 water filter is also known by Pentek part number 455903-43 / 45590343. This filter has been tested and certified by NSF International to NSF / ANSI Standard 53 for the reduction of cysts. More technical information about Pentek FloPlus Series filters can be found here.